Titanium curved barbells are one of the hottest body jewelry in the fashion industry these days. It is for anyone who wants to make a quick style statement. This curved ball titanium is effortless to wear which is one of the main reasons why it’s become such a craze among people lately. The curved barbells not only look fashionable but are also durable. Titanium comes with these qualities and hence the curved barbells have become a hit in the fashion world. You will find titanium jewelry like curved Ferido barbells during the ramp shows and also in the street fashion due to its high fashion quotient and its durability. Titanium piercing jewelry also comes with healing qualities and hence it is one of the best choices for first timers. It is less painful to wear and appears glamorous. Use the curved barbells anywhere on your body and the area will appear attractive without hurting the skin. Also, the anodized variety is cheaper in price compared to other precious metals. Colorful and temptingly curved barbells can certainly elevate your body piercing to another level. You would do well to select such barbells in place of plain old rings to highlight your delicate piercings. Navel or lip; eyebrow or tongue; these barbells can definitely add oomph to your style and turn you into an irresistible person that everyone yearns to get introduced to. The anodized titanium or pure G23 titanium segment rings are easy on the skin too and come highly recommended as the ideal metal for piercing jewelry. They can be long lasting as well because of the durability of titanium and you are welcome to buy additional balls or cones as accessories for reusing the barbell time and again. You can totally carry off any look in these as they come in designs and shapes to meet your every single mood. So be it, earrings, or belly button piercing, there is something for everyone. Titanium segment rings are quite safer to wear and very not reactive to any sort of allergies. This is the main reason why it has attracted a number of people. Titanium segment rings are quite lighter than other metals due to its lower density. 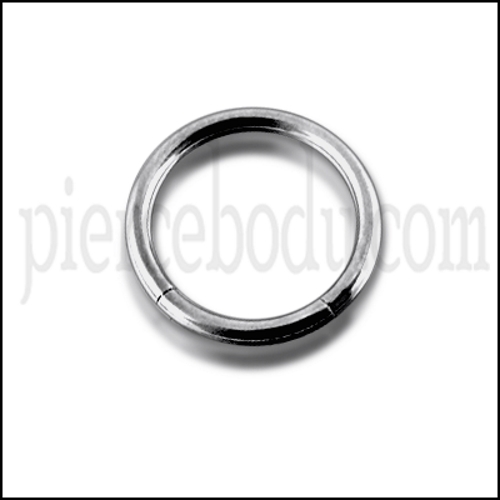 Titanium segment or hoop nose piercing is sophisticated pieces of body piercing jewelry and they are very smooth as compared to other metals. These rings have easily removable curved segment present in it which acts as a closure mechanism. The circular boundary present in them makes it quite comfortable to wear. Wear these titanium segment rings and noticed easily. You can these rings in a wide range and with the cutting-edge designs. Barbell defines your body very beautifully curved in a U- shape. We have some circular barbells unbeatable offers just for you. It considers as a great alternative for captive rings and uses any type of piercing from ear to toe. We have a great range of titanium captive bead rings like acrylic, titanium, surgical steel and many good quality materials. We have them in a great range and decorative ends to add panache to your lifestyle. Decorative ends comprise of skull, ball, rainbows etc. You can also customize them to meet what you desire. So come and grab your best deals on barbells.